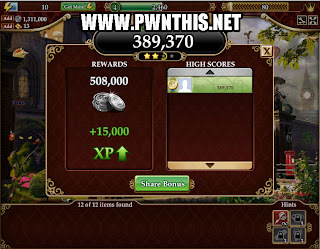 Playdom makes some of the most popular online Flash games around, including Wild Ones, ESPNU College Town, City of Wonder, Social City, Bola, Market Street, Sorority Life, Mobsters, World Series of Poker and Deep Realms brings to you Gardens Of Time [click to play Gardens of Time]. The simple cheat is that you can easily pause the timer when searching for the items, so that you gain the maximum Time Bonus. Play any scene of your choice. When you are ready to search for the items, just Enable Speedhack and set value to 0. Now, notice when you click on the CORRECT items, you will hear a sound. Just click all the 6 items then set the speedhack value back to 1 and you will gain Max Time Bonus points. This is a no-brainer cheat, so if anyone can't figure this out, you really shouldn't be cheating. What's up i am kavin, its my first occasion to commenting anywhere, when i read this piece of writing i thought i could also create comment due to this sensible piece of writing.